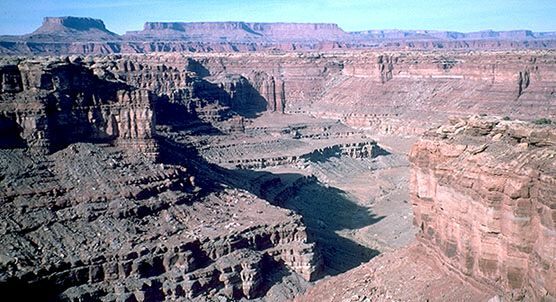 Canyonlands exposes millions of years of sediments deposited by wind and water. The same forces work to modify and erode this accumulation. The Green and Colorado Rivers are the major tributaries and have carved the abysmal inner gorges. The Colorado is almost a thousand feet below us and has been confined to this bed since Miocene times. The upper layers of the distant buttes are composed of Wingate Sandstone, a rock which formed during the Jurrasic when the area was part of a Saharan-sized desert. Wingate breaks off into the massive vertical cliffs which form the outer rim of the canyon. Beneath the Wingate is the Kayenta formation, composed of siltstone and shale formed from river deposits. This layer erodes easily, undermining the Wingate above it. White Rim Sandstone (visible as a white layer spanning the picture above the gorge) deposited in Permian times caps the lower levels of the plateau at around 5100 feet. Here the gorge cuts entirely through Pennsylvanian rock.